E-ink-Reader. Touchscreen types of tablet.. The most prevalent malfunction of tablets and e-readers is crushed screen. At small deformations only up glass with touch layer is damaged. It's called touch panel or touchscreen. If the hit and deformation are too strong the display of your device is damaged too. Attention: authors aren't responsible for malfunctions of your devices, which can be got as a result of using this information. Everything you do is for your fear and risk. Using of such method removes tablet or an e-book from warranty service! Is it possible to change the touchscreen yourself? Of course, it is, but you should be very careful. Methods of change for different models are similar and are shown well on Youtube. For example here, here and here. Labeling, which must be ordered by the panel, most often located on its ribbon cable. Optimal temperature of desoldering drier is 180 degrees. It's not enough for deformation of plastic case, but it's ok for melting of glue, by which touchscreen is connected to the case. If the older layer of glue doesn't hold even after warming-up of touchscreen on the perimeter, you may need glue for repairing mobile phones B-7000 or thin 3M double sided tape on the plastic base. 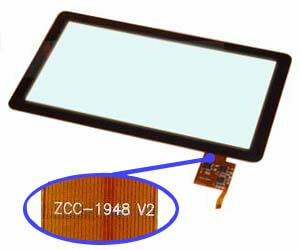 We have accumulated quite a lot of information on the touch panels used in modern tablets and reader with TFT and IPS screens. To ease the the problem of finding, buying and replacing the panels in your device, this information has been kept in the general table below. In the table "Link" below the icons with arrows are links to pages online - shops offering this model touchscreen.